1.) Track your shopping sources. If you’re selling vintage, chances are you’re buying it first! Keeping track of your favorite thrift stores is a timesaver in the long-run. When I moved from Milwaukee to Austin, I had to learn ‘my shops’ all over again. Use a small notebook to record which stores you’ve tried, and make notes about your purchasing success. You may even want to rate each stop on a 1-5 star basis. There are some places I’ll never go back to, and others that have proven to be treasure havens time and again. Some stores always have great shows, and others are a jewelry gold mine. This strategy might be harder to apply to estate and garage sales, but it’s still important to note what is and isn’t working for you, so you can better utilize your time and resources. 2.) Remove stains & repair damage. DO THESE FIXES BEFORE THE GARMENT IS SOLD. You want to make sure the repair can be done and it will prevent any delays in shipping. 3.) Capture your garments right. If I had a pet peeve for this biz, it would be seeing otherwise dedicated sellers taking horrendous photos. Oh how I loathe the poorly lit, wrinkled, low-resolution shots of dresses strewn across a bed. Even if you are selling on Ebay or Poshmark, we’ve come too fair technologically for that kind of oversight. Could you imagine Target just taking photos of clothing on a crappy plastic hanger in the warehouse with boxes in the background? Nevermind pixels, because even the latest phone can take decent photos. But proper lighting is key, and NEVER use your built-in camera flash, even if it’s a fancy Nikon SLR. Only external flashes can provide the right look. There’s a plethora of information online, the key is finding what is going to work for your right now, given your space and budget. I’ve shot with light boxes, near a window with good lighting, outside against a fence, and now I’m inside on a backdrop with a Canon t3i and a 430EX II external flash. At the very least, get your garment on a hanger. As for post-shoot, I highly recommend using Lightroom and the ‘sync’ feature to edit your photos quickly. If your colors are off, use the white balance feature. Learn an efficient method to edit photos, because the last thing you should be doing is losing precious hours between a photoshoot and getting your listings up. 4.) Provide great customer service. For real, though. Time and time again I hear about Etsy shop owners giving one-word responses to customer inquiries or just not replying at all. Treat your customers as if they’ve already made a huge purchase and structure your conversations in the same manner as you might reply to a work e-mail (after all, this is a business, right?!) I can honestly say that in all my years of selling online, I have never gotten into any sort of nasty quarrel with a customer. I really do utilize a ‘the customer is always right’ mentality, and sometimes that means biting your tongue or taking the time to reword a response in the most respective and fair manner. Sometimes I mess up: I’ve sent the wrong item to two different people in Europe, I’ve accidentally resold items, and I’ve missed a few small repairs over the years. All of these situations can be stressful, but keep a calm demeanor and let the buyer know you’re handling the situation. Offer a discount code for the trouble is also of mutual benefit. OK I buried the lead here, but my #1 piece of advice for great customer service? Respond as quickly as possible, and stay in touch over sensitive situations such as delayed packages or refunds. Regardless of what is being handled, everyone feels more better when their inquiries are being handled promptly and politely. 5.) Optimize your time & your space. That kind of thinking delays success, and fails to recognize that all accomplishments are earned one step at a time. I’ll contradict myself here and say that sometimes I’ve regretted not taking some of these steps sooner: obtaining a decent dress form, purchasing my external flash, and using Lightroom to edit my photos. These made a big difference in my progress and pushed me further along towards my business goals. But I am proud of my journey, and not letting limited starting capital keep me from pushing ahead. 6.) Be consistent in your approach. I first starting selling vintage in my handmade brick-and-morter boutique. 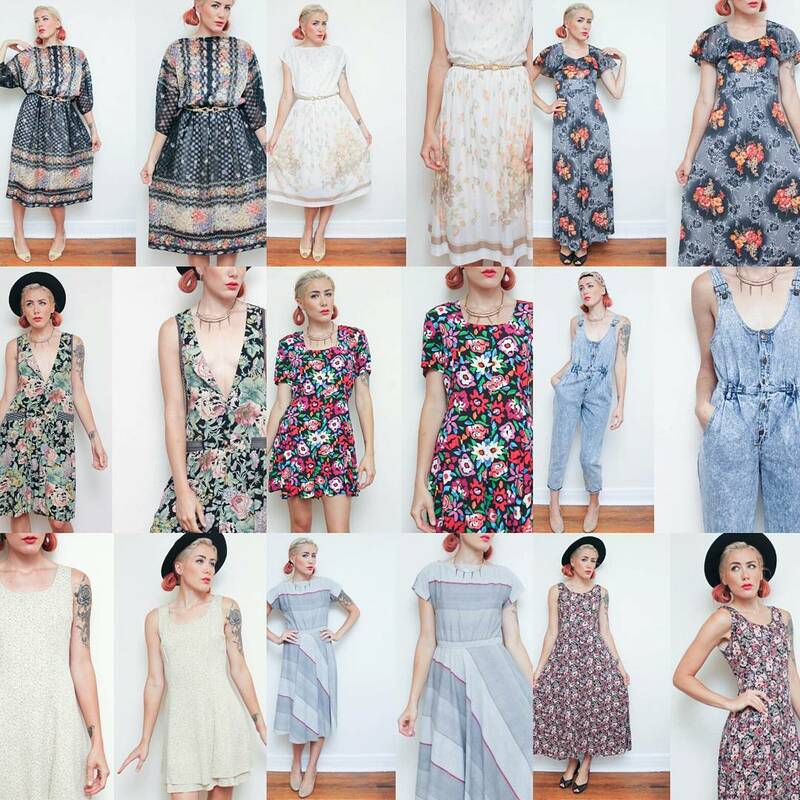 They were mostly dresses from my private collection, and it was a great way to help cover shop rent during the slower months. Launching GINGER & JUDY later on was overwhelming, because now I was no longer just buying for myself, but rather amassing a collection that would hopefully spark the interest of people I would never meet in real life. Whatever your buying strategy is, I recommend picking pieces that you truly enjoy, and find YOUR niche. Sounds simple enough, right? I find I’m much more productive when working with items I’m eager to shoot and share, and I’ve learned to trust that my taste will evolve just as the trends of the day ebb and flow. You’ll also need to find out how you’re going to capture these goods in an informative manner as well. I use a short description of the item, followed by the details you’ll find on tags: brand, country origin, material and size. Most importantly, I include all the pertinent measurements. If you don’t do this for all of your listings, chances are a customer will have to ask, or worse- they will move on elsewhere. Staying consistent will help your work flow, show professionalism, and help to establish the look and feel of your brand. *Oh, and if you’re using Etsy, you MUST use the copy feature if you don’t already. Personally I need to see success brewing in order to maintain stamina. Setting unrealistic goals may cause you to abandon the undertaking altogether once the struggles of business are revealed. Find others you can collaborate with and keep each other motivate, and most of all learn to enjoy the journey! This post is very helpful! I like how you use the bold and italics a lot. Makes it stand out and catch your eye. Love how you give little tips here and there! Your photo at the top is beautiful also! I will be looking forward to need posts!